Grace Road Group Company Ltd continues to grow with its restaurant venture. Its most recent expansion was with the opening of Patisserie Pacifica in Kundan Village in Princess Road, Suva. Now they have added another two restaurants at Damodar City, Suva and Tappoo City, Lautoka. Grace Road Group public relations manager Grace Park said: “People were only able to enjoy Noodle Story in Lami and in Suva area. 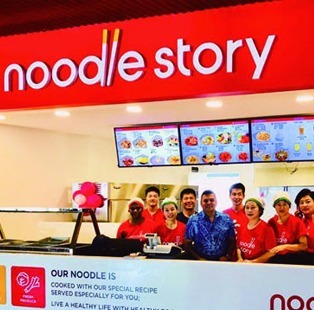 “As demand grew, we have opened the fourth Noodle Story outlet in Damodar City food court. All of Grace Road Group’s brand names have a meaning and so does Noodle Story. “Noodle Story means a restaurant where all of our customers can spend happy moments, enjoy healthy appetising meals and make a story of their own. “Noodle Story presents its own unique fresh and healthy menu made with fresh fruits and vegetables grown in Grace Farm. Ms Park said that they have added new dishes to the menu such as sweet and spicy dumpling, crispy noodle with spicy sauce for a more pleasant service. The restaurant operates daily from 9am to 9pm. Noodle Story operates in Lami RB Patel Complex, Tappoo City Suva, FNPF Plaza and now in Damodar City. I Sushi is their first Korean-Japanese style sushi shop in Sunny Pizza, Tappoo City, Lautoka. Ms Grace said that “I” stands for love in Japanese and is the depiction of the sincerity and love that it serves its customers with. “Local customers now have the opportunity to get a great taste of sushi and roll. “It serves a wide range of sushi rolls made with fresh vegetables and fish, chicken, and even menu specifically geared towards vegetarians,” she added. I Sushi is a shop-in-shop booth with Sunny Pizza that serves two different menus. “It is a perfect one stop restaurant for anyone who is wanting to try good sushi rolls without feeling limited. “The most popular menu is creamy and soft avocado placed on top for a healthy and “green” taste of the green dynamite,” said Ms Park. I Sushi uses uses local fruits, vegetables and fish to create combinations. The idea of such unique sushi is by their expert sushi chef with over 35 years of experience in Canada. There are plans to open I Sushi in Suva soon. As next year approaches, they work towards a target of opening four more restaurants. The South Korean church-based Grace Road Group of Companies Ltd operates a total of 42 shops and restaurants in the country. It has a strong emphasis on healthy food and agriculture.